There have been big changes in the construction of carpet and carpet fabrics over the last few years, most noteably commercial and domestic carpet has become shorter. Because of the denser packed pile, extraction cleaning methods are leaving the carpet wetter for longer, with more residual dirt left behind due to poor airflow. 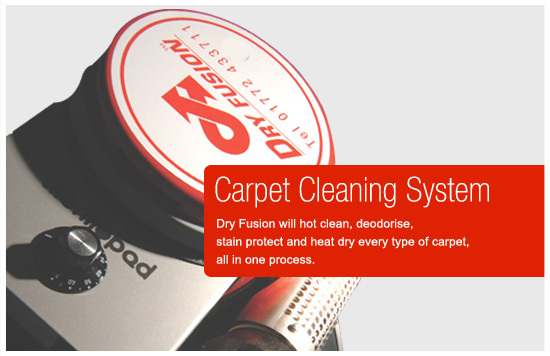 Dry Fusion has been designed to maximise cleaning performance on these new carpets. It works because it doesn't rely on airflow to clean or to dry. Dry Fusion is the only carpet cleaning system that hot cleans, deodorises, stain protects then heat dries every type of carpet. It's all in the same process, and because it is patented, nobody else can use this amazing system of cleaning. Dry Fusion takes all the best features of hot water extraction (hot solution, "Shot of Steam"), and dry cleaning (low moisture, mechanical agitation) and combines them with the patented hot cleaning pad system that constantly heats the fibres as they are being cleaned. This combination delivers some of the most outstanding results ever seen. Customers don't want to walk on 'squishy' carpets or to leave the house or office to wait for the carpets to dry. They want it dry to walk on immediately and that's what Dry Fusion gives them. It's bone dry in under half an hour! Because it is a whisper quiet system, hospitals, commercial buildings can all be cleaned during business hours. Two unique mechanisms work to keep Dry Fusion cleaned carpet virtually stain free* to maintain that just cleaned look longer. A Fluorocarbon Resin places an invisible protective shield over every fibre during the cleaning process. It helps prevent dry grit, dust as well as spills lodging within the carpet. Even walked in mud and oily spills have difficulty seeping in. Because the fibre is effectively "non stick" when you DRY FUSION clean, vacuuming removes more soil, plus the vacuum cleaner is easier to push. A unique Blocking Stains additive helps block dye sites in the fibre that normally allow food spills and beverages becoming ugly stains. When re-cleaned with Dry Fusion - using the "shot of steam" most stains are removed without spotting or special effort. For more details on the Dry Fusion hardware and machinery, please visit www.dryfusionuk.com. * Stain Free : Certain food colours used in Indian and Asian foods and soft drink, actually dye the carpet and cannot be removed with Dry Fusion Activator.